CT_BT_GRAFFITI|Mausoleum.2 proposes to virtually recast the lost physical space of the Mausoleum to Georgi Dimitrov at its former site, where the Mobile Studios will be temporarily located in Sofia. The Mausoleum to Georgi Dimitrov (Sofia, BG) used to be the most remarkable public symbol during the Communistic period in Bulgaria. Using Bluetooth technology embedded in many mobile communication devices, visitors to the exhibition who have this functionality on their mobile phones are invited to activate it and will receive a series of visual and audio fragments which recreate the space of the former Mausoleum. Using this commonly accessible networking technology offers do-it-yourself possibilities for virtually rebuild and personally maintaining lost and stolen spaces important in history and memory. As graffiti in public space confronts passers-by with intentional messages, this work addresses notions of presentation space vs. private space and representations of time and space visually and virtually. 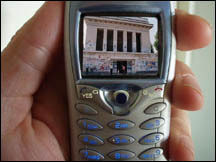 Series of videos, digital images and audio works that are transmitted to viewers on their own portable Bluetooth enabled devices. An installed computer station will transmit the pieces. Visitors will be able to interact by adding their own images, sounds and videos to the shared database. An information card (postcard format) will be distributed at the site and throughout the city prior to the installation.